I can't believe it's time for the August Newsletter! Where did July go? I wagged my tail and it was gone. 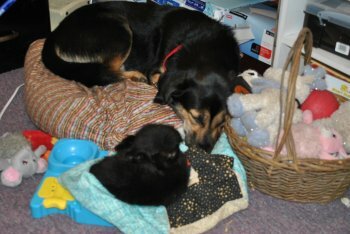 About 3 weeks ago, one of our customers brought in 2 little black kittens that were abandoned at about 4 weeks old. Poor little things were so young they fell over when I sniffed them. I am the proud foster Dad of these 2 little kittens. Mom sometimes brings them in with us because I miss them when I'm at work and they're not. I whine and pace a lot because I'm worried about my little kittys. I'm happy when they're with me all the time. Unfortunately, Mom says we really need to find them furever homes for them. Mom is going to get them they're first vaccines and worm medicine, so, she said she will be asking for a rehoming fee. She has to wait to see how much the medicines are to determine the fee. If you are looking for a kitten or know someone who is that would give them a good home, call my Mom. Here's a photo of me and my kittens. Are they just the cutest little furballs? Daddy Obi Wan with his little charges. He was even carrying them around when they were smaller. Sometime in August we have a Minions panel with2 coordinating fabrics. We also have a construction play mat with 2 coordinating fabrics, and Snoopy coming. 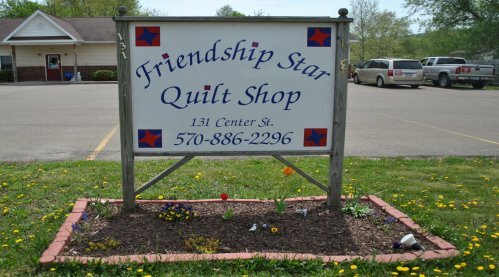 All are from Quilting Treasures. Some flannels and batiks from Willmington Fabrics, some Hoffman Fabrics should be coming in, too. Grandma will not be in the Shop from August 4th- August 17. It will be just Mom, me and sometimes my kittens, Inkspot and Greasespot. If Mom has to close the Shop early, I will send out an email letting you know what day and time. Our scheduled classes begin again in September and we will be having a Saturday where we will be giving away a free pattern and a demo on how to make one of the blocks. You will have to sign up and get a ticket at least 3 days before the Pattern/Demo Day. You will also need to bring your ticket to get into the class. Seating will be limited for Pattern/Demo Day. You can pick up a class schedule on the treadle machine in our foyer. A reminder for the quilters taking Cathy Brown's One Block Wonder Class in October...we have the One Block Wonder book you will need for the class in stock. The Row by Row Experience is starting it's final 5 weeks. It will be ending on September 8th. We have gotten our Row by Row Experience Winner. 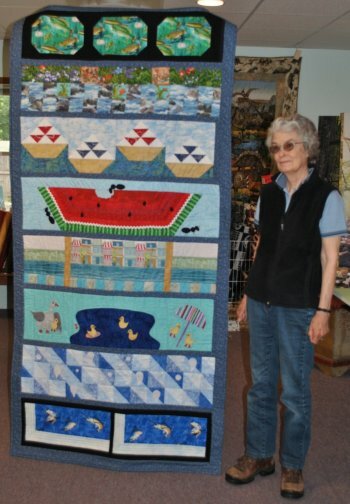 Meryle P. of Corning, NY brought in her finished Row by Row Quilt just a few days after we announced in July's Newsletter that we were still waiting for a Winner. Meryle's Row by Row Quilt is on display in our Gallery. 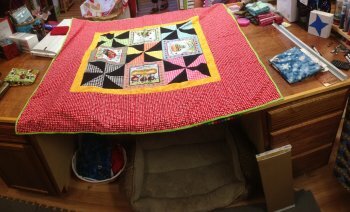 For August Show N Tell, we have 2 quilts and a table topper by Debbie B and Deb C.
Sorry about the side shot. This is Debbie B. 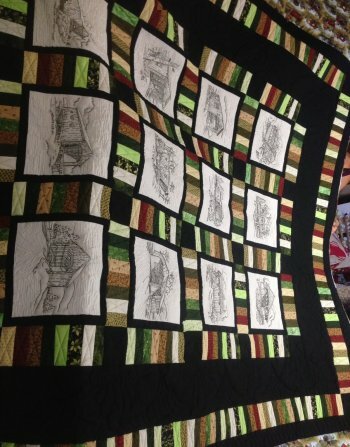 's King Size quilt she made for her husband. Debbie hand embroidered all the Covered Bridge squares. Debbie B. 's table topper. The red check has ants on it. This photo definitely doesn't do it justice. 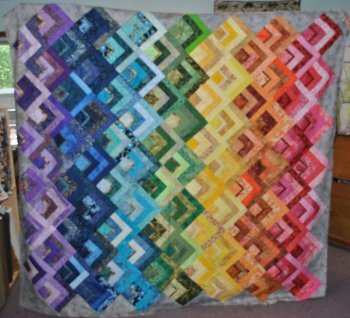 Deb C.'s Rainbow Quilt. She saw this pattern and decided it needed to be made with rainbow colors. It's time for me to take my afternoon nap under the cutting table. Have a fun Summer and keep an eye on up coming Newsletters. We have some beautiful Collections and their patterns coming this Fall to keep you busy when it the weather becomes too cool to be outside.